At Ethical Image, philanthropy always comes first. Giving back to the community and creating a better world to live in is never an afterthought – we embody it to the core. 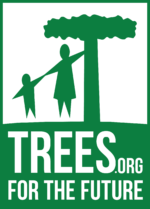 Trees for the Future (TREES) is an international development nonprofit that meets a triple bottom line by planting trees: poverty alleviation, hunger eradication, and healing the environment. Through their Forest Garden Approach they train farmers to plant and manage Forest Gardens that sustainably feed families, raise their incomes by 400 percent, and end deforestation. TREES receives donations to implement our work in areas where they can have the greatest impact. They currently work across 6 countries in Sub-Saharan Africa: Cameroon, Guinea, Kenya, Senegal, Tanzania, and Uganda. Since 1989, TREES has planted over 150 million trees. We actively encourage all of our clients to give back and help them to engage with a charitable initiative, community service, or philanthropic pledge. 1% for the Planet is a global organization that connects dollars and doers to accelerate smart environmental giving. They recognize that the current level of environmental giving – only 3% of total philanthropy – is not enough to solve the most pressing issues facing our planet. Through their business and individual membership, 1% for the Planet inspires people to support environmental organizations through annual membership and everyday actions. They advise on giving strategies, we certify donations, and they amplify the impact of the network.